German economy has been on the forefront when it comes to influences on the economy of Europe. It is one of the founding countries of the EU (or European Union). Initially, the EU was purposefully created to ensure that the continent of Europe never goes to war, thus guaranteeing a stable continent that may never be torn apart. Soon after the Second World War, the neighboring countries of Germany were skeptical that the country might re-militarize. 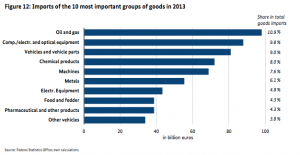 Germany has been on the forefront when it comes to influences on the economy of Europe. It is one of the founding countries of the EU (or European Union). Initially, the EU was purposefully created to ensure that the continent of Europe never goes to war, thus guaranteeing a stable continent that may never be torn apart. Soon after the Second World War, the neighbouring countries of Germany were sceptical that the country might remilitarize. Therefore, in order to curb this, France thought that the best method was an economic approach, rather than an ideological one. Since France wanted to tame Germany, the concepts of the new EU were based on Franco-Germany relationship, thus making these two countries the biggest economies in Europe at the time. Because Germany was desperate after the World War II, it meant that the country was to start rebuilding the country from scratch. The country was to build a new country that was democratic, and this was to be completed using an economic growth based on that particular democracy. The other member countries of the EU became part of the rehabilitation of Germany. As a country, Germany appreciated the massive boom it received from the integration. As a result, the state made the most of the monetary support and the opportunities that came along with the support. Even though the money was helpful to the country, the industriousness of the Germans had a great impact on the recovery of the country. The country had (and still has) a very strong work ethic other than having a large population. The large population, the work ethic and the Marshal Plan money played a significant part in ensuring that Germany re-emerged as the main economic power. Nowadays, Germany has to face the growing issue of globalization, which compels the country to evolve if it is to keep up with times. The next section will examine the challenges Germany has to face in this new era of the globalized economy. Globalization is by definition the increasing interdependence among countries, economies and their citizens. Since 1870, a new trend of growing integration has been recognized as the first wave of globalization. The tendency has lost momentum during the First and Second World War, but it continued with a stronger influence after 1945 until present. Nowadays we live in a more than ever globalized world where trade, immigration, foreign investment and international flows are all linked through the existence of so-called global markets. Furthermore, globalization also involves a cultural transformation. Non-economic elements such as cultural differences are becoming more homogeneous across countries. In order to critically analyse globalization and its consequences, let us firstly recall the main factors that have driven such evolution. It is utterly evident that technology has played the most important role in developing globalization. Innovation and technological change like industrial revolutions have made enormous improvements in productivity. Further industrialization led to economies of scale. Higher production capability allowed producers to expand trade internationally. Technology spurred new developments in transportation which became internationally more efficient and cheaper. New economic theories on trade, as it will be analysed later, contributed to the liberalization of trade and investments, which heavily increased as a result of reductions in trade barriers, tariffs and quotas. Regarding the service industry, the usage of the Internet implied abatement of communication costs, and it allowed companies to reach customers on a global scale although operating locally. Once the main causes of globalization have been outlined, let us see which advantages and disadvantages it brought to Germany. In 2006, the openness measured 75. In 2013, the figure increased to 94.9 with Germany still being the 3rd world’s largest exporter (after China and U.S.A.) and even importer (after U.S.A. and China). The figure has risen since steadily since many years with swings in exports and imports. For example, during 1990 to 1995, German exports to developing countries surged by about 10% per year on average, while German exports to industrial countries increased by only 3% over the same period. This also demonstrates how globalization tends to affect developing and developed countries in a different way. Higher growth takes place in developing countries but still there is positive economic expansion also in developed economies. The law of comparative advantage allocates mutual gains to both parties. The main point is that the Germany benefited much from increased international trade, especially in terms of exports which fostered local employment and production of fine-tuned, high-quality, German-made industrial products. This trend was also due to the political change that globalization imposed on European countries. As globalization destroys barriers in favour of interdependence, there was a need in Europe to create a Union of trading partners that would have operated with a single currency. Globalization destroys not only trade barriers but also political ones. Globalization is also argued to have occurred at the expense of state power, and state sovereignty over domestic economic policymaking (J. A. Piazza, 2002). The EU can be thought of as a result of globalized political integration. In the case of Germany, the rise of the strong Euro currency has been a blessing for boosting German exports. Although Germany GDP growth has been bolstered by globalization, there are some side effects which pose challenges to Germany. First, the law of comparative advantage and the subsequent phenomena of both outsourcing and offshoring have contributed to the large erosion of competitiveness in the German manufacturing sector. Labour costs in Germany are 50% above the average in G-7 economies. Recently, Germany’s structural unemployment has risen due to this loss of German labour market competitiveness. The government has put effort in issuing structural reforms in order to create a more flexible labour market. However, the German fiscal system heavily relies on taxes to offer large unemployment subsidies and an excellent welfare system. This system might be put at risk by these new structural reforms which would decrease government income to fund social programs. Ultimately, it is not easy for politicians to achieve such plans without losing their social consensus. Another principle of globalization is higher mobility of capital among countries. The rigid German fiscal system, comprising marginal tax rates above average, has discouraged investors to hold their capital in Germany. The outcome was an outflow of money toward countries with lower tax regimes. In fact, the German government sees again structural reforms, like deregulation and liberalization of financial markets, as the only measures capable of attracting investments back in Germany. As both advantages and disadvantages of globalization affected the German economy, in my opinion the overall balance over years has been positive for the European country, which thrived with sustained GDP growth. Even though globalization raises international competition in local markets, “the realization should grow that a new era of competition has begun and that it deserves a positive assessment” (G. Langguth, 1999). In this section, the basis of the argument is the renowned factor-endowment theory developed in the 1920s and 30s by Eli Hecksher and Bertil Ohlin. Let us consider the trade statistics that Germany displays. 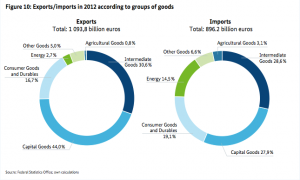 As data in Appendix 1 show, Capital goods are the main component of German exports, followed by intermediate goods, and consumer goods and durables. According to the Hechschert-Ohlin model, a nation exports the product in the production of which a large amount of its abundant and cheap resource is used. Therefore, the conclusion appears to be that Germany disposes of a relatively high amount of capital compared to other trading nations. In fact, it is widely recognized that Germany is one the richest developed countries in the world. Always referring to Appendix 1, the three top categories of exported goods are vehicles and vehicles parts, machinery, and chemicals which all stand out for being products requiring a significant amount of capital in their production processes. So far, the application of the Heckschert-Ohlin Theory holds the validity. The theory further states that Germany should import those goods in the production of which a relative scarce and expensive resource is used. The endowment of this resource should be lower for Germany. Instead, the chart shows that imports primarily consist of intermediate goods as well as capital goods accounting for almost the same percentage. Here the factor-endowment theory should be critically questioned, as according to that, Germany should be importing anything except capital-intensive goods. Further room is left for critical analysis of the theory. However, some researchers have already tried to assess the validity of the theory empirically. Leontief carried out the most quoted test (W. Leontief, 1953) and the outcome exactly resulted in the famous Leontief paradox of the factor endowment. In his case study concerning USA, considered as a capital-abundant country, exports were found to be even less capital-intensive than import-competing goods. Further critical evaluation of the factor-endowment theory by researchers focuses on measuring the accuracy of Heckscher-Ohlin predictions. Another author has decided to test the theory not only considering two goods and two factors but three concepts as factor intensity, factor abundance and trade (Leamer, 1984). Leamer chooses to study the theory within the framework of a generalization of the model that is expressed by the equations namely attributed Heckscher-Ohlin-Vanek (HOV). The HOV equations take into consideration the three concepts previously stated. The way to measure the accuracy of the theory would be to obtain direct and independent measures of all three concepts and to gauge the extent to which these measurements conform to the HOV equations. Leamer concludes that international trade is conceivable as a linear function of factor endowments only if the hypothesis of no consideration of resource intensities is assumed. This means that Heckscher-Ohlin model holds validity only if an approximation of the HOV equations is accepted, thus excluding factor intensities in the reasoning. Another academic has analysed the relationship between factor endowments ad comparative advantage as specifically relating to the changing pattern of comparative advantage in manufactured goods in the process of accumulation of physical and human capital that characterizes economic development (B. Balassa, 1989). This analysis is of particular interest to the actual case study of Germany because the country has recently enjoyed such accumulation of capital. 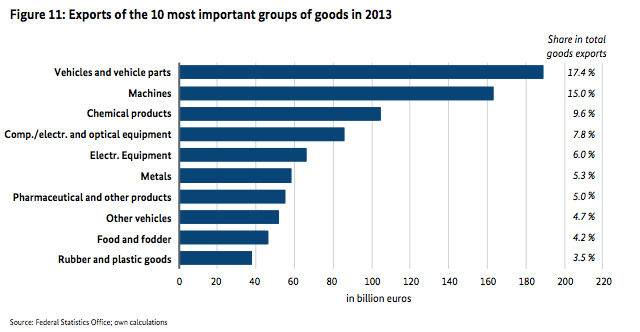 Plus, the German top-exported products are also manufactured goods. The findings show that differences in a country’s exports are substantially explained by differences in physical and human capital endowments. There is a positive correlation between exports and factor endowments, and the evidence supports the Heckscher-Ohlin theory. Balassa also tests the theory by simultaneously introducing trade flows, factor intensities and factor endowments in the context of the previously explained investigation of the pattern of comparative advantage in manufactured goods in a multi-country framework. The author sets the hypothesis that countries endowed with capital will export capital-intensive commodities. The three factors considered in the model are physical capital, human capital and labour. In the end, the findings of the analysis show that relatively capital-abundant countries export relatively capital-intensive commodities. So the author succeeds in demonstrating the validity of the factor-endowment theory. Regarding this view of the pattern of comparative advantage, a dynamic vision of it, it must be underlined that comparative advantage is not constant but it transforms through time. Countries have experienced such shift during the past, and the rate of change just increases further with globalization. As already discussed in the previous section, technological change plays a key role in this transformation. So the change in the pattern of comparative advantage can be studied from the perspective of a technology-based theory of trade. In this country case study, manufactured goods are the most exported products. Such goods, like chemicals and vehicles, are produced by undergoing a manufacturing process which involves a high degree of technology, innovation, and R&D. Therefore, in my opinion, technology substantially contributes to German comparative advantage. My idea is supported by literature on the product life cycle theory, which states that technological innovation is a major determinant of trade patterns in manufactured products (R. Vernon, 1966). Such manufactured products undergo a predictable trade cycle, which would end with the loss of the country’s comparative advantage unless investment in technology, R&D or innovation is pursued. The product life cycle dooms a product to its end. As a result, the firm producing such good would lose some degree of competitive advantage given by that product. Ultimately, the country where the firm manufactures the good will tend to lose its comparative advantage at the end of the product life cycle. Such decrease in a country’s comparative advantage is further incremented when other countries will begin trading the same good because other companies can copy a production process unless a patent legally protects the know-how or the technological manufacturing process. However, knowledge in the long-run tends to lose its exclusiveness. It is my view that such technology-based theory of trade is extremely important to Germany. Let me demonstrate this with a rational analysis of the relationship between imports and exports of 2013 data in Appendix 1. 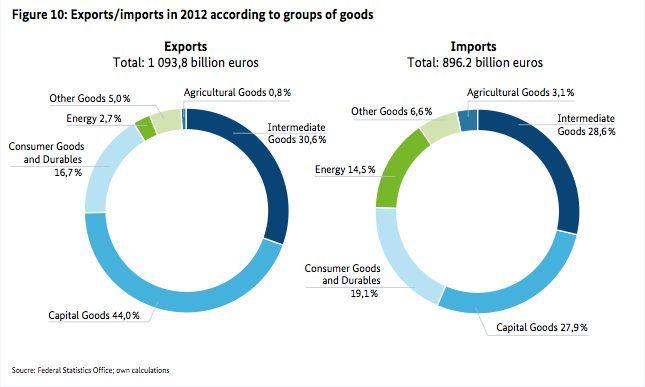 The main group of imports is intermediate goods accounting for 28.6% of all imports. These comprise mostly oil and gas, components, electrical and optical equipment, and vehicle parts. All these products possess the common characteristic of being able to run a transformation process through which a final fine-tuned outcome is produced. It is undeniably evident that Germany mainly imports goods which are used during the manufacturing processes of higher quality products like vehicles, chemicals and machines. Therefore, as my hypothesis suggests, technology and industrial know-how must play a vital role in production processes of final German products exported worldwide. If Germany considers technology as an important factor for the country’s comparative advantage, the implication is that the government should invest in R&D subsidies and technological improvement. However, this is an issue that can be dealt with within a trade policy framework that will be now addressed. “Because of the Korean free trade agreement, South Koreans who want Oregon blueberries are going to see their prices go down because we will be getting rid of a 45 percent tariff on this Oregon product.” (Ron Wyden, 2015). This quote explains the intensions and the effects trading policies have in a nation´s economy. Changing or modifying any condition affects the local economy of a nation. Trading Policies are composed of agreements, documentation, taxations, and other social regulations, which determine the dynamics of the local economy. In this section, it will be reviewed the importance trading policies have within a nation, and the various types of trading conditions that help arrange a nation´s regulatory system. Germany has an accessible economy; they are the 3rd exporter and importer country in the world. International trade leads to higher productivity and higher income. Therefore it is important for a country, in this case, Germany, to regulate their trading policies in a structure that optimizes and improves the local economy by focusing on importing the scarce resources, and exporting the abundant and cheap resources; therefore the regulations must be modified to obtain the economic movement the nation is aiming at. For Germany, it is simpler to trade with countries such as Spain, France, and Italy since they all form part of the European Union, and share the same currency and similar trading protocols. This union reduces trading barriers among EU nations. This means that anything related to tariffs, license, and social regulations is more or less practical within the EU. Trading policies are defined in the regulations, or laws related to the exchange of goods and services. From an international perspective, these regulations include tariffs, trading barriers and non-tariffs protocols. Moreover, the EU regulation will be critically analysed and how it forms part in the national German trading policy, relating to the local economy. Nowadays, the European Union is viewed as a general territory for trading, and as a general aggregated economy. This means that the majority of imports and exports that occurs in Germany are under the EU standard protocols. There are small details that differentiate each country´s trading policies. For example, in some cases Germany takes into consideration other measures than France, but usually they all follow the standard European Union guidelines. A tariff is defined as the regulated taxes imposed on imported and exported goods. This type of regulatory measure is considered one of the trading barriers. 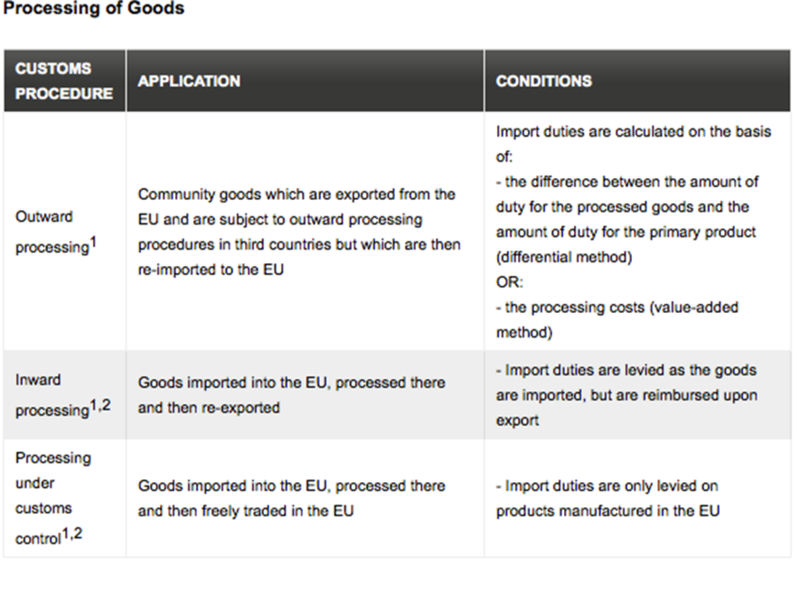 There are various types of measures when it comes to tariffs. For example, as the country wants to protect the local economy and limit specific imported products, its trade policy usually imposes a high tariff on these types of goods. As the following example explains, it shows the purpose of tariffs and how they change according to each economic situation a nation is facing. Germany´s import turnover tax has reached 19%; this tax is applied to non-EU imported goods. Germany´s major imports are goods for the manufacturing process. These goods come from nations that are not from the European Union; therefore any industries related to this type of imported goods are charged with this tax rate. In different economic situations and necessities, this tariff rate may increase or decrease. This explains the complexity that trading policies have within a nation, since every type of imported product, or exported has their own specific protocols. Furthermore, different tariffs are imposed on each product to control imports and the domestic economy; Since Germany aims to import more goods for manufacturing processes such as Oil, gas, and metals it would be necessary for the German economy to maintain a considerable low tariff rate on this type of commodities. 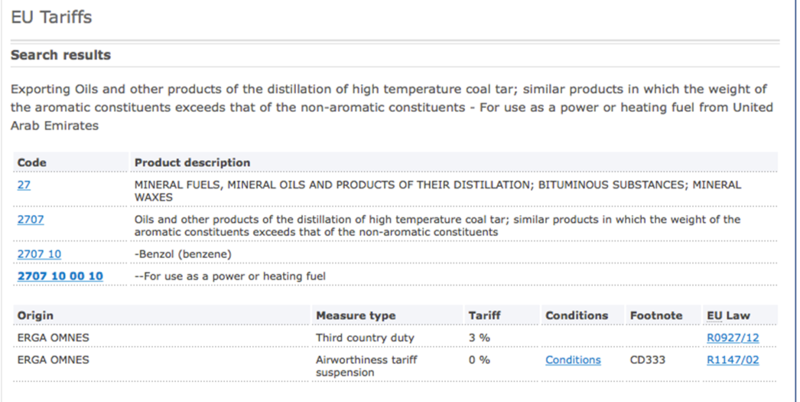 According to the European Union Commission (See Appendix Fig.1 & Fig.2), any oil fuel, imported from the United Arab Emirates, which is intended for heating and as a source of energy, has a 3% tariff rate. 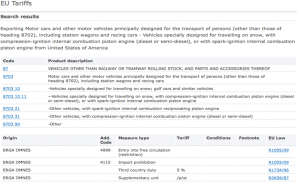 Whereas any finished motor vehicle imported from the U.S.A has a 5% tariff rate. This explains the dynamics that a regulation such as tariff rate creates on the local economy. Germany depends on raw materials such as oil and other commodities in order to optimize their production of primary exports such as vehicles, and machinery. Importing final products such as vehicles has more complex regulations and higher tariff rate compared to manufacturing commodities, because vehicles production is one of the primary strong local industries, and principal exportation of the German economy. Tariffs are considered as just one of the many possible mechanisms regarding a nation´s trading policy. There are other trading barriers that form part of a nation trading policy such as licenses, imported quotas, and other social regulations. Licenses have a significant influence on EU regulations. These types of regulatory measures are given to businesses by the government, which provides the authority to businesses to import specific products approved by the license. The European Union Commission provides both importers and exporters with some concrete documentation in order for them to have control over products entering and leaving the territory. These documents diversify the conditions of trading amongst all other nations. There are various types of documentation needed to control imports and exports. The single administrative document (SAD) is important for the EU protocols. This document states the written declaration of the imported good, which later on is presented and stored by the custom´s authorities. Companies within the EU mainly use this type of document. On the other hand, foreign companies need another type of documentation such as the Economic Operator Registration and Identification (EORI), this document provides an identification number to all foreign companies wishing to trade in the EU. The conditions of documents depend on the nation and the relationship it has with the European Union commission. It is clear the relevance that this type of documentation bears when forming a trading policy, since it assists to track and record every trading transaction for a later-on view on the economic movement a nation is achieving. Another measure of structuring a trading policy, are the various agreements made within the trading nations. The Mutual Recognition Agreement (MRA) is an agreement between the EU and the USA. This agreement has simplified the trading procedures between the nations, because it reduces the complexity of customs procedures and improves the relations amongst each other. European Union nations generally rely on the TARIC (The Integrated Tariff of the Community) which is the general European Union database that determines the different taxations, customs regulation, and licenses needed for each type of product exported and imported in the European Union territory (See appendix Fig. 3). This database has all the information necessary to take into consideration the terms & conditions when trading among Germany and EU nations. For example; TARIC determines regulations, cost, and licenses required for importing live animals to German territory, or commodities such as oil. 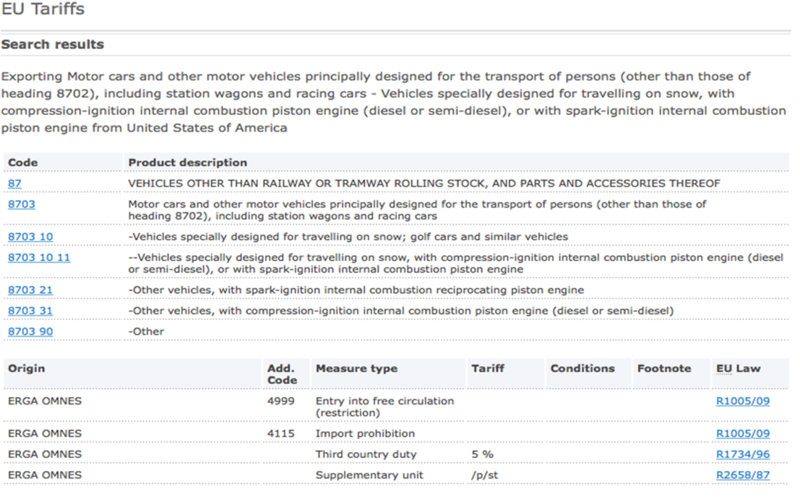 This database also applies when exporting goods out of Germany. Each industry and product have their specific search code, which by entering the code in the TARIC database it defines the condition and regulation of the product. This applies for imported products, and exporting products. 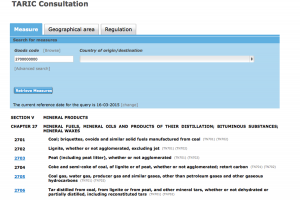 Additionally, this database is considered as a tool for trading countries to identify the documentation and conditions needed in order to export or import in EU nations. Germany´s customs regulations, and bureaucratic procedures can be considered a central trade barrier. Consecutively, this type of protocols also limits the international import level in the local economy. Complex security standards also complicate the access to products coming outside the EU. 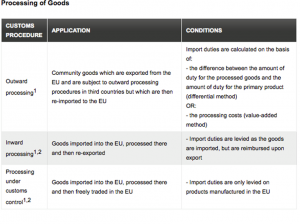 “Goods in the customs territory of the EU either have the status of Community goods (goods manufactured or obtained in the EU or “goods released for free circulation”) or of non-Community goods (all goods which do not comply with the criteria of Community goods). 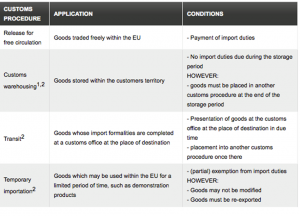 Importers may only be in possession of a limited amount of non-Community goods, or in some cases none at all, according to the amounts permitted by the customs administration. 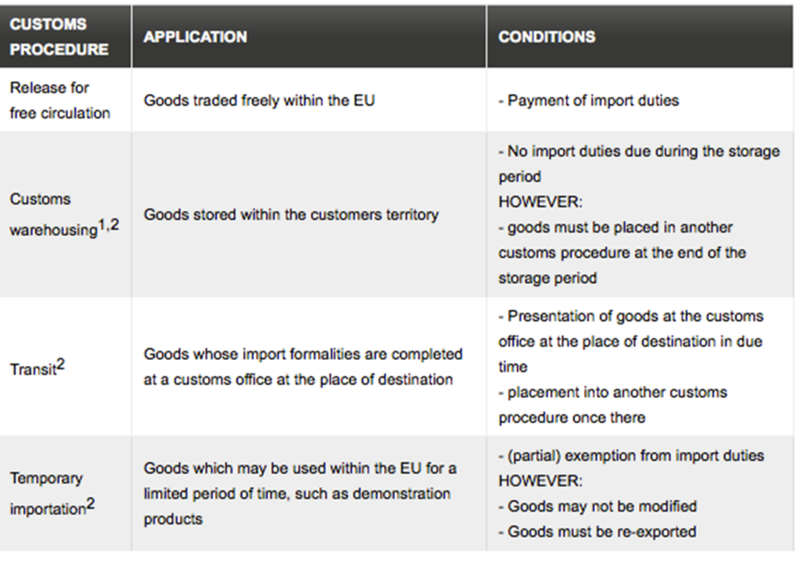 Different customs procedures apply subject to the reasons why goods are imported. Goods may be imported to be sold, repaired, temporarily stored or used in the production of other products for re-exportation. In total, the Community Customs Code stipulates eight different customs procedures. The intended use of the goods determines which customs procedure is applied.” (gtai.de, the federal ministry of economic affairs, 2015)— (See appendix Fig. 4). This shows the diverse strategies and procedures that the government takes into consideration in order to achieve the economic dynamics they aim at for the local economy. This statement proves the convolution of customs regulations and why it is considered a trade barrier. Products are classified by different regulations concerning if they are manufactured within the EU community or outside EU nations, generally the products that benefit more in the German economy follow simpler regulations, compared to the unnecessary products. Normally, products such as oil, metals, and manufacturing-processing goods will have fewer complex regulations, since Germany contemplates that those kinds of products are necessary for the economic dynamics they pursue. Focusing on having free international trade, Germany has aimed at offering considerable low tariffs, and establishing a complex regulation system when it comes to safety and declaration procedures, in order to maintain a control over the imported products, and optimize the local industries. Fundamentally, they focus on having a major control and increase trading barriers on goods that come from outside the EU territory, and reducing trade barriers within European nations. Besides this type of regulations, there are other trading policies such as the prohibition of products entering the European Union, and relations with some nations. For example, it is not possible to import in the EU any product coming from North Korea since EU does not consider North Korea as a potential trading nation. Therefore, any relations are prohibited. On the contrary, EU focuses on importing and exporting with nations that maintain good relations such as the U.S.A.
Reducing trade barriers with EU nations is essential for Germany, because it lets the country have good relations amongst European nations, and simplify all type of trading regulations. This policy also leads foreign countries to view Europe as a whole nation considering the EU trading protocols. Furthermore, trading regulations are the tools and guidelines a nation uses in order to obtain the economic movement they aim at. Besides protocols, nations aim to arrange these regulatory structures in a way that benefits all foreign nations that maintain an excellent relation with. After analysing various types of regulatory measures nations take into account, Germany is considered an open trade economy. They maintain good trading relations amongst the majority of non-EU countries. The measures they undertake focus on offering considerable low tariff rate, efficient safety procedures, and an excellent trading information database such as the TARIC. These measures have led Germany to become one of the leading economies in the world, making the country a great trading partner amongst the top trading nations. A nation trade policy also heavily influences the exchange rate volatility of the country’s currency. The next chapter will analyse the forces that shape the exchange rate. While economic theories affect the exchange rate on a long-term basis, the effect of political events and changes in economic data is more immediate. In the case of Germany, market events and economic data coming from Germany and the European Union can make a direct impact on the trend and the direction of the Euro. Those market events and financial data changes also have an effect on stock prices and other financial instruments. In comparison to other markets, Germany, as a member of the European Union, managed to lower the impact of volatility by following regulations, restricting the use of domestic currency by non-residents and setting limits on banks foreign exchange positions, which reduced NEER volatility. Specifically, this refers to the after adopting limits on the net foreign exchange positions (IMF, 2004). Currency exchange is a massive global financial market. Currency Exchange World Trade facilitates and enables access to foreign currencies for travel. With the advent of the Internet, e-commerce has significantly increased the need for foreign currencies. A converter currency calculator helps in calculating the applicable rates and the amounts corresponding to exchange currencies. There are many factors that determine the exchange rate applied. These factors are analysed below. Interest rate decisions affect exchange rates significantly. As interest rates are increased, currency becomes more expensive. In the opposite case, it becomes cheaper. Other measures of monetary policy forces affect exchange rates as the actual bond purchases by the ECB and FED. Sometimes, even reports of central bank meetings create exchange rates volatility. Thus, the monthly reports of the Federal Reserve are thoroughly analysed by professionals in order to find out what the central bank wants to signal to markets and the path that is chosen to achieve targets. Exchange rates are influenced by relevant data that provides insight into the strength or weakness of the economy. This includes data on public debt and budget deficits. If this data is bad, the impact on the exchange rate is negative. A lasting, stable economic growth, a good labour market, and a fairly balanced trade balance all lead to a strong currency. The same is true for the steady development of purchasing power and a reasonable inflation rate, usually around 2%. This group includes most monthly surveys of consumer confidence, industrial production, the development of the service sector for storage, especially in long-term assets, the assessment of the economy of the future development (for example, ZEW indicator of the economic expectations), purchasing manager indices, and others. Sometimes there are early indicators that will be closed with the help of future economic performance of an economy. Rating agencies assess not only the creditworthiness of individual companies but also the creditworthiness of the states. If the rating is positive, more interest has to be paid for debt. Significant downgrades of the rating have a negative impact on the exchange rate. Exchange rates can be artificially influenced by speculation. Large speculators are even able to create real currency crises. The consequences of currency crises may be the collapse of currency devaluation, or the task of a monetary policy fixed exchange rate. An example of a “successful” currency speculation was the actions of American investor George Soros, which went against the fixed exchange rate of the British pound to war in 1992. Once central banks recognize an attack against a currency, they try to take monetary policy defences. However, these measures are often not satisfactory. So, it was in the case of Soros. Despite all efforts, the Bank of England could not maintain the fixed exchange rate against other currencies and the British pound finally had to float freely. With commercial partnerships such as the European Union, the adoption positively affects the exchange rate and the dominance of such a currency in the world currency market. Such partnerships provide an economic region of stability and economic strength dominance over another county to win over currencies. The trade that exists between two nations affects the exchange rates between the currencies of the two countries. When a country imports more than export from the same nation, the currency of the importing country loses value. The nation will demand more importers of other countries’ currency than they get from their exports. A currency converter can help calculate the cross-application exchange rate between two currencies in the country. An international balance of payments determines how the national currency exchanges with other world currencies. The balance of payment is the difference between a country’s imports and exports. When a country imports more than it exports, it has a negative balance of payments. This means that the country cashes in more foreign currency from other nations as requested; it is less foreign currency from its exports compared to its import requirements. On the other hand, a balance of payment is positive when the exports of a country outweigh its imports in currency. A country with a negative balance of payments has unfavourable exchange rates. Errors and omissions (remaining stock). The trade balance recorded the export and import of goods in the balance of services (services) posted to the so-called “invisible exports and imports” of services and factor services in the areas of travel, transport and insurance services, investment income, patents, and licenses. The transfer balance sheet includes all payments made and received, private and public transfers, without consideration. These include remittances from migrant workers to their home countries, support payments, contributions to international organizations, and foreign aid. The financial account recorded all receivables and liabilities to foreign countries. In accordance with the terms of financial transactions, a distinction was made between short-term and long-term capital account. The limit set by convention is one year. The currency balance sheet shows changes in net foreign assets of the Central Bank. The net foreign assets consist of the foreign reserves of the Bundesbank minus its foreign liabilities. This reflects exchange rate fluctuations (exchange rate), in particular, the US dollar, forcing the Bundesbank to account for its foreign currency holdings to valuation adjustments. Second, changes in the allocation of special drawing rights are recognized by the International Monetary Fund. The residual item is the balance of statistically unpaid spin-off transactions arising from differences in rating or recording errors in the summary of the main balance. The balance of payments is a systematic presentation of all economic transactions between residents and aliens. In Germany, this data is obtained from the Federal Statistical Office of the movement of goods and the foreign trade law reporting the Deutsche Bundesbank. There is data on cross-border payments and capital and public and private households, as well as information collected from business relations with foreign countries. Along with the international investment position, statistics provide the necessary information about the global integration of goods and financial markets. Discussions on “locational competition” are also important. Multinational companies also receive information on trade and capital links between states. The balance of payments is also required by the European Central Bank to assess the monetary situation of the Euro. It will continue to be made available to the EU institutions, such as the Statistical Office (Eurostat). In addition, Germany has to fulfil reporting obligations arising from membership in international organizations (OECD, IMF). The methodological structure of the balance of payments is based on the requirements of the IMF (Balance of Payments Manual). Notes in the balance of payments, the economic transactions of an economy are systematically aggregated with the rest of the world for a certain period of time, therefore, it is not a balance sheet in the sense of a point in time statements of assets and liabilities, but a flowing account. The balance of payments includes not only transactions that are associated with cross-border payments, but also commercial operations with no payments or immediate payments (Deutsche Bundesbank- Balance of payments, 2015). The German BOP for 2013 is showing a current account surplus of €206 billion, which is €7.4 billion higher than the previous year. This increase was caused by the economic improvements, which were barely accompanied by any rise in imports from outside of Europe. In addition, the German economy profited considerably from better terms of trade on the back of a considerable fall in prices of internationally traded commodities and semi-finished products. Export momentum was flat in 2013. This was mainly because demand for German-made, high quality, capital and consumer goods in the emerging market economies (EMES) was more subdued during the reporting period than it was in preceding years, when it went up (Deutsche Bundesbank, 2013). Despite being an economic powerhouse of Europe, Germany, just like any other economy, is not immune to global financial crises. The country has government debt rate standing at 83.2 percent of its GDP and an unemployment rate of 7.1 percent. These statistics are based on 2010 findings. A significant portion of Germany’s strength is attributed to its strong manufacturing sector, meaning that the country never relies on financial services industry; neither does it depend on the property market. This explains why the country was not severely affected by the recent global economic crises. However, it is warned that the country might be exposed to future troubles because of its heavy reliance on trade with China in case there is trouble in the Asian markets. The German economy is surely bolstering and buoying the euro. That is if the country was not there as an anchor to the stability of the euro, the world (mainly Europe) would not be witnessing recovery from the economic crunches. Nevertheless, the high economic weight by Germany does not mean that the country can do all recovery alone. The current crisis in Eurozone (occurred in 2014) has brought about skepticism among politicians and media houses across the continent, where some reports even mentioning old tensions and rivalries. The experience of the integration within Europe designates that the selection of an exchange rate mainly depends on medium and long-term perspectives of the institutional and economic integration within a particular region. That is, the more the advancement of an area, the higher the need for stability of the exchange rate. It means that need for a stable exchange rate relies on a number of objective parameters. At the same time, the stability relies on the political willingness as well as on ability to implement the process of integration. A number of impacts have played out from the integration and the current economic issues being witnessed. The single currency (Euro) could create confusion as it has over the past decades. Nevertheless, the feeling is that much greater outcomes are yet to be witnessed, which may include a breakup. It is hard to find a solution that will not involve the ECB, thus further weakening the euro in the future. The main problem here is the breakup of the integration, rather than the involvement of the ECB, where oil price becomes part of the problem due to the weakening of the euro. The collapse of the Euro is partly because of the weak demand for oil from China and Europe. The main reason for the collapse is the flourishing supply, and this has been compounded by panic selling of the euro currency. Because of this, the fall in oil prices overstates the weakness of the world economy. On the other hand, no matter the reason(s) for the fall, it is expected that lower energy should assist with the re-ignition of a global growth. The other distress is the slow progress in emerging economies. The major part of the slowdown development took place from 2010 to 2012, after which the growth has been stable. The weakening of the euro is because of the economic impacts due to the current situation in Germany. The opinion here is as a resultant of bad news in regards to prices of the commodities. The critical evaluation of the issues mentioned above has led to the following conclusions. First of all, globalization has posed serious challenges to Germany as the local labour market is becoming less competitive. Phenomena like outsourcing and offshoring are threatening employment conditions, and capital is leaving German accounts to seek lower taxation. With the help of academics’ theories on the sources of comparative advantage, it has been shown that Germany can be considered as a capital-abundant country and exports mainly comprise manufactured capital goods as the factor endowment theory supports. Germany trade policy is addressed toward the increasing integration of the country within the European Union. Trade policies as regulations, tariffs and import taxes tend to increase as for products imported from countries outside the EU while trade barriers are notably lower among European countries. There is a trend toward unification of the national German policy with the EU trade policy. Ultimately, Germany itself is one the countries that benefited most out of the European Union formation. In recent times, statistics have indicated that the slowdown in Germany’s economy has some impacts on recession. Germany has a direct influence on the volatility of the euro. As earlier mentioned, this is because of the country’s independence and strength in both the financial and property sectors. Reliable indicators show a significant slowdown in the manufacturing industry of Germany. The slow growth is attributed to the slow demand in Asia, thus meaning that the euro is volatile to the market in Asia. This marks a significant shift in Germany exports, putting into consideration that the country has the world’s most imbalanced economy, which is based towards exports and its balance of trade surplus that is worth 7 percent of its GDP. Recent financial and economic developments have proved positive trends indicating stabilization. However, it is important to remain watchful since there are substantial challenges in the labor market. At the same time, large imbalances from pre-crises periods still exist. Full and active implementation of reforms is paramount in strengthening the euro. The implementations require joint delivery by several tiers of the government and the stabilization of growth can be achieved only by pursuing a stronger pan-European integration of the European Union. Balassa, B. (1989). Comparative advantage, trade policy and economic development. New York: New York University Press. Bundesbank.de, (2015). [online] Available at: http://www.bundesbank.de/Redaktion/EN/Downloads/Publications/Monthly_Report_Articles/2014/2014_03_balance.pdf?__blob=publicationFile [Accessed 17 Mar. 2015]. Bundesbank.de, (2015). 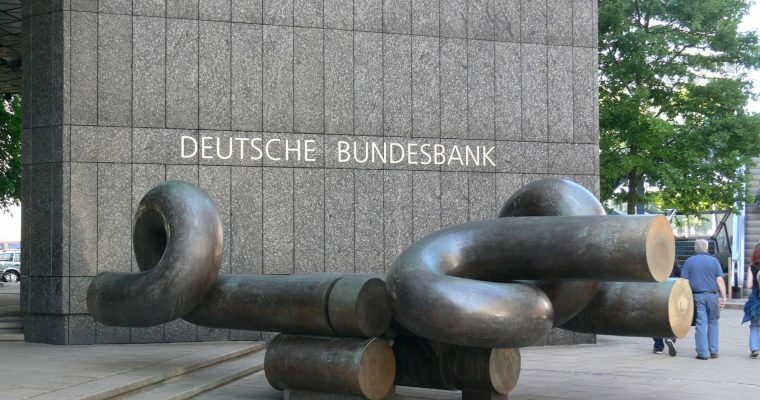 Deutsche Bundesbank – Balance of payments. [online] Available at: http://www.bundesbank.de/Navigation/EN/Statistics/External_sector/Balance_of_payments/balance_of_payments.html [Accessed 17 Mar. 2015]. Bundesbank.de, (2015). Monthly Report January 2015. [online] Available at: http://www.bundesbank.de/Redaktion/EN/Downloads/Publications/Monthly_Report/2015/2015_01_monthly_report.pdf?__blob=publicationFile [Accessed 18 Mar. 2015]. Camdessus, M. (2015). Globalization and its Challenges for Germany, Europe, and the IMF. [online] Imf.org. Available at: http://www.imf.org/en/News/Articles/2015/09/28/04/53/spmds9701 [Accessed 18 Mar. 2015]. Comunale, M. and Hessel, J. (2014). Current Account Imbalances in the Euro Area: Competitiveness or Financial Cycle?. SSRN Journal. [online] Available at: http://www.dnb.nl/en/binaries/Working%20Paper%20443_tcm47-313481.pdf [Accessed 18 Mar. 2015]. Ec.europa.eu, (2015). Customs unions – European commission. [online] Available at: https://ec.europa.eu/taxation_customs/business/calculation-customs-duties/rules-origin/customs-unions_en [Accessed 18 Mar. 2015]. GmbH’, G. (2014). GTAI – Internationale Märkte. [online] Gtai.de. Available at: http://www.gtai.de/GTAI/Navigation/DE/Trade/maerkte,did=1034732.html [Accessed 18 Mar. 2015]. Gtai.de, (2015). GTAI – Customs. [online] Available at: http://www.gtai.de/GTAI/Navigation/EN/Invest/Investment-guide/The-tax-system/customs,t=common-customs-tariff-in-the-eu,did=437570.html ) [Accessed 18 Mar. 2015]. James, J., Marsh, I. and Sarno, L. (2012). Handbook of exchange rates. Hoboken, New Jersey: John Wiley & Sons, Inc.
Kirkegaard, J. (2014). What Should Surplus Germany Do?. [online] Peterson Institute for International Economics. Available at: http://www.piie.com/publications/pb/pb14-14.pdf [Accessed 18 Mar. 2015]. Kollmann, R., Ratto, M., RRger, W., in ‘t Veld, J. and Vogel, L. (n.d.). What Drives the German Current Account? And How Does It Affect Other EU Member States?. SSRN Journal. Langguth, G. (1999). Germany in the age of globalization. The Washington Quarterly, 22(3), pp.89-108. Leamer, E. (1984). Sources of international comparative advantage. Cambridge, Mass. : MIT Press. Madb.europa.eu, (2015). 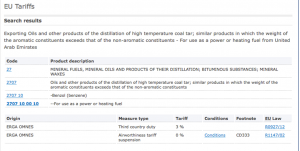 European Commission : Market Access database : EU Tariffs. [online] Available at: http://madb.europa.eu/madb/tariffLibDetailPubli.htm?langId=EN&datacat_id=AT&countryid=&submit=Search&countries=AE&hscode=2707100010#conditionsTip-1 ) [Accessed 18 Mar. 2015]. Piazza, J. (2002). Going global. Lanham, Md. : Lexington Books. Sercu, P. and Uppal, R. (2000). Exchange rate volatility, trade and capital flows under alternative exchange rate regimes. Cambridge, UK: Cambridge University Press. Stat.wto.org, (2015). Trade Profiles. [online] Available at: http://stat.wto.org/CountryProfile/WSDBCountryPFView.aspx?Language=E&Country=DE [Accessed 17 Mar. 2015]. Ullrich, K. (n.d.). A Comparison Between the Fed and the ECB: Taylor Rules. SSRN Journal. Vernon, R. (1966). International investment and international trade in the product cycle. The International Executive, 8(4), pp.16-16. wto.org, (2015). Trade Profiles. [online] Available at: http://stat.wto.org/CountryProfile/WSDBCountryPFView.aspx?Language=E&Country=DE [Accessed 18 Mar. 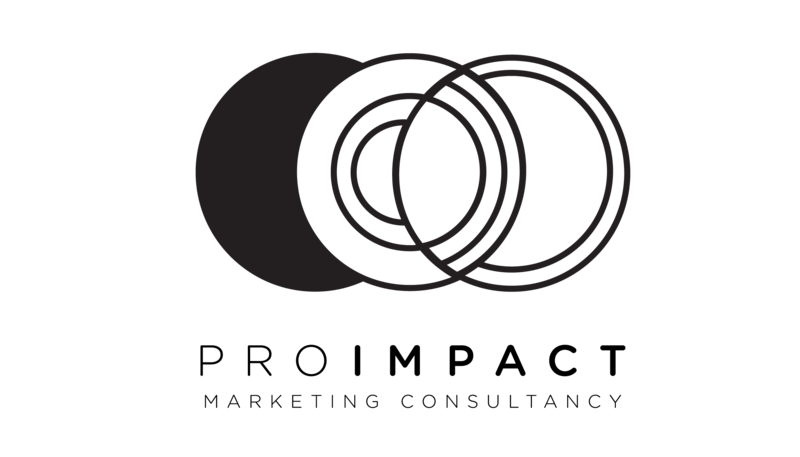 2015].